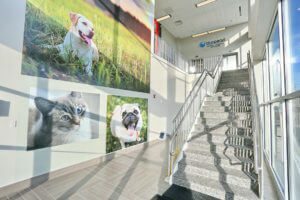 Our 24 hour pet hospital is located in Paramus and also serves Emerson, Fair Lawn, Glen Rock, Ho Ho Kus, Hudson, Oradell, Ridgewood, River Edge and Maywood, along with the counties of Bergen, Hudson and Essex. Emergency: Call ahead to our 24 hour emergency vet hospital in Brandon and let us know you’re coming. No appointment is necessary. Learn more about your emergency visit. Did your pet swallow something toxic? 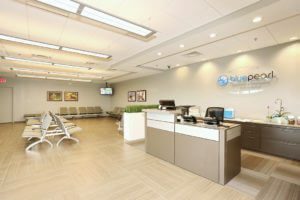 Our BluePearl animal hospital in Paramus has 24 hour emergency vets to assess the danger with dialysis equipment that could be part of the solution. Paramus is among a small number of private treatment centers around the country offering hemodialysis for animals. Our 19,000 square foot hospital opened in 2016 with diagnostic equipment that includes a CT scanner, ultrasound and fluoroscopy. We also have a blood bank on site. Not all pets need so much technology. Our knowledgeable team will keep you informed, so that you are part of the decision. But when your pet needs a higher level of care, we are ready to provide it.